If you live in Utah and have seen tulips bursting from the damp soil, robins hopping around for worms, or teenagers sluffing in the park, you might think it’s spring. But natives of this state are well aware of Mother Nature’s wry sense of humor. It’s never really spring in Utah. You look out the window and there’s a beautiful blue sky. The temperature is 55 degrees. 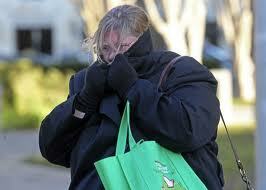 However, you walk outside to get the newspaper and the wind is so cold your eyebrows freeze and fall off your face. “Joke’s on you!” Laughs Mother Nature. Skank. You’ll see bright green leaves gently pushing their way into the sun, soon to become daffodils, hyacinths or tulips. “Not so fast!” says Mother Nature, who then dumps a foot of snow on the poor flowers, and then runs off to bask in the Bahamas. You walk outside with jeans and a jacket. It’s warm. It’s not windy. The sun is shining. You go back inside to put on shorts and flip-flops. You walk back outside into a blizzard. The calendar might read March, April, May or June but any Utahn knows spring doesn’t start until June 30 and then ends on July 1 when summer hits and temperatures soar into the 90s. Just to be safe, keep two different sets of clothes in the car at all times, plus an umbrella, picnic basket, gloves, Frisbees, scarves and sunscreen. Just coverin’ the bases. It’s the same in NC. This weekend was in the 80s, sunny and beautiful. Today high in the low 50s, grey and rainy. Not only is the plant life confused, I’m confused! Hopefully it will warm up for both of us soon! Peri is clearly the most clever and funniest blogger on the Internet. She should have a national column–glad we all get to enjoy her humor in the meantime, before she’s discovered!